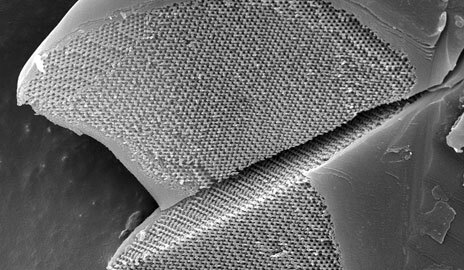 (Nanowerk News) Evolution has created in bees, butterflies, and beetles something optical engineers have been struggling to achieve for years — precisely organized biophotonic crystals that can be used to improve solar cells, fiber-optic cables, and even cosmetics and paints, a new Yale-led study has found. The Yale team used high-intensity X-rays at the Argonne National Laboratory in Chicago to investigate color-producing nanostructures within hair-like structures that cover some species of butterflies, weevils and beetles, bees, and spiders and tarantulas. They found that the architecture of these nanostructures are identical to chemical polymers engineered by chemists and materials scientists, according to the report published May 14 in the journal Nano Letters ("Structural Diversity of Arthropod Biophotonic Nanostructures Spans Amphiphilic Phase-Space"). 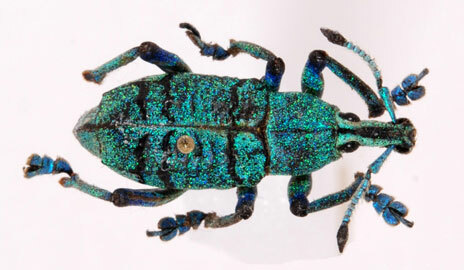 These artificial nanostructures need to be an order of magnitude larger — such as that found in the scales of beetles and butterflies — in order to interfere with light and make saturated colors. Engineers, chemists, and physicists currently find it difficult to control the self-assembly of synthetic polymers to achieve the desired shape of molecules over a large area, Saranathan said.